This year for Leopoldo’s 83 Birthday we went to central Europe for three weeks in November. Here is a portrait of my precious jewel looking chipper on a blustery day when the brisk autumn wind kept us moving along from one glorious sight to another. 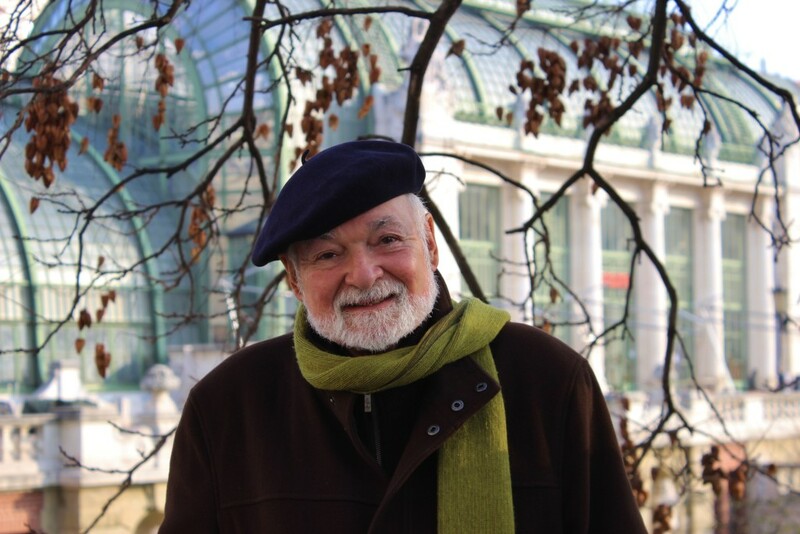 We began our tour in Munich and then went by train to Prague and Vienna, staying a week in each of these fabled cities. In each country our hotels were elegant and luxurious and everyone was nice as pie to us. I am thankful to report that English was the acceptable second langue of most folks we came in contact with because my German and Czech are nonexistent. I was greatly humbled by our driver who comfortably whisked us off in his posh Mercedes to the airport in Vienna; he spoke German, French, Spanish, Portuguese and fluent English. It is this kind of European sophistication that really impresses me. Our first stop was the Hotel Opera in Munich right off the grand Maximilian Strasse which in addition to being a main thoroughfare of the center city where state and city government is located, is also the most chic shopping avenue where many of the great international fashion houses are represented. As you can see in my photograph, the distinctive black and white façade of our hotel had a painted decorative scheme that accentuated and embellished the fairly simple architecture, making a handsome impression. This style of painted building must be traditional in Munich because the major royal palace, known as the Residence, also employs this technique on two of its street façades as well as some of the interior courtyards. 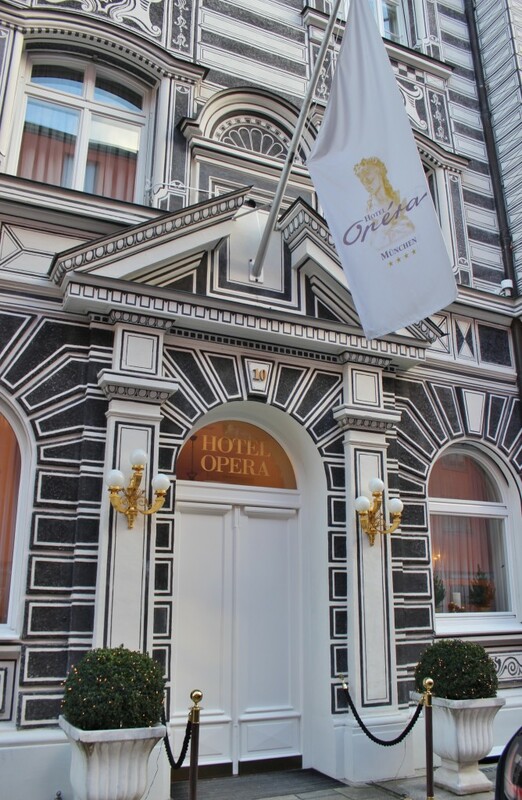 During the daytime the immaculate double doors of Hotel Opera magically swing open when you approach and in the evening all one has to do is press the discreet brass button on the archway and we were immediately admitted. 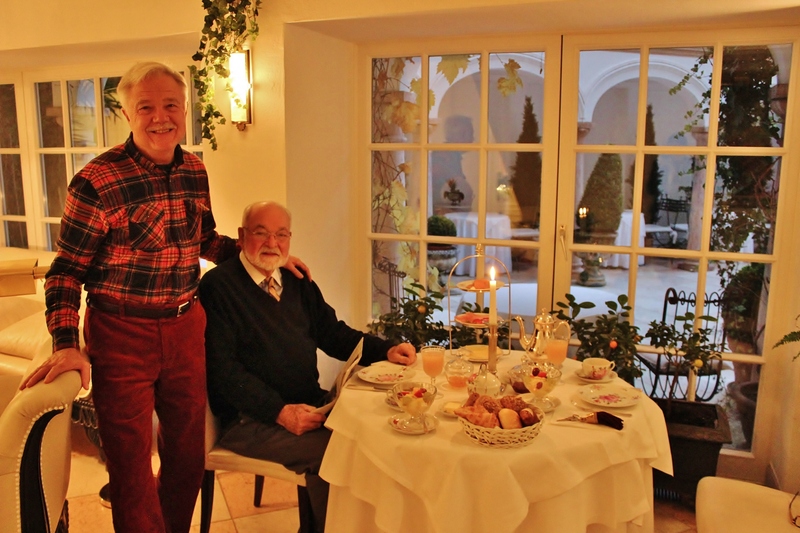 Here are The Two Happy Husbands at our delightfully elegant breakfast table at the Hotel Opera, set with eggshell thin porcelain painted with rose bouquets, shining silver, crystal stemware, crisp linen and a single candle casting a warm glow on a delicious assortment of dishes including smoked salmon, fresh fruit, assorted pastries and breads, egg dishes to order, etc. Outside the window is an enchanting courtyard surrounded by an arched loggia supporting a marble balustraded walkway. In the warmer months breakfast is served in the courtyard which is alive with potted plants, topiary shrubs and a gently trickling fountain. This is a view of St. Anna’s parish Church of the Lehel neighborhood of Munich. This handsome Romanesque revival church was designed by Gabriel Seidl and constructed between 1887-1892. It is considered one of the most successful examples of historical revival in Munich and I would agree. During the week we were staying at the Hotel Opera, very nearby, I went in to say my prayers there or walked by every day and studied the building from all angles. I was still not sure if it was an original Romanesque church until I researched it just now on line. 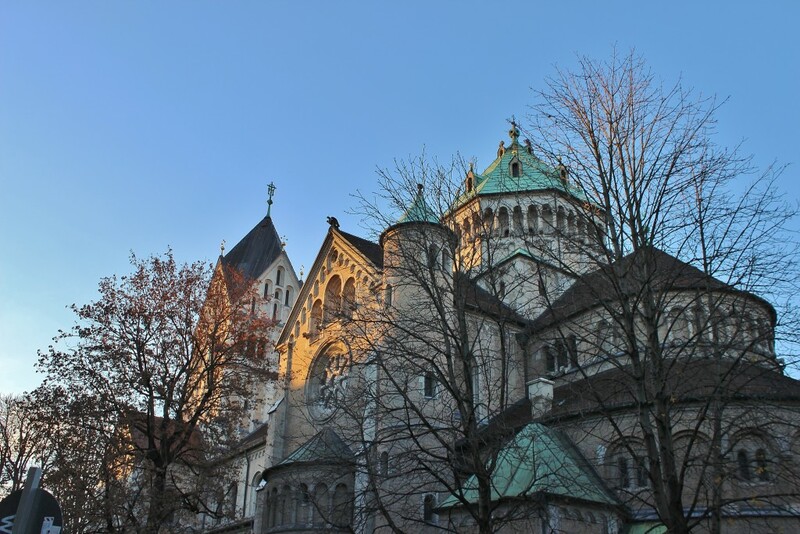 St. Anna’s is administered by the Franciscan Order and they have a monastery across the street. Both places were heavily damaged by bombs in WWII. The monastery had to be completely rebuilt in its original Baroque/Rococo style. St. Anna’s was not fully restored until the 1980’s. Because of my sheltered life in USA I have not experienced any of the direct madness of war and I am shocked to come across the results of war and destruction. I believe that no one wins any war. Everyone loses in war and the supposed conquerors only corrupt their own souls by feeding the bonfire of vanities. The way to stop wars is to stop fighting. The way to evolve beyond the temptations of self-righteous violence is to teach by example. If you are struck, turn your cheek – not to allow another blow but to avoid one. This is fluid power at work, when water cascades onto solid rock it wears away resistance and smooths rough edges into paths that allow tumults to subside. Grace deflects rage conserving energy to create. War by its definition is an extreme and unnatural aberration that serves no purpose except to profit the manufacturers of the war machine. War does not solve or resolve any problems or conflicts. Like Pandora opening her box, once the evil of violence is unleashed it grows in fury until the fire storm of destruction consumes all in its path grinding the essence of humanity into sterile dust. Embedded in the elaborately coffered ceiling of the Trier Rooms in the Residence Palace in Munich is this charming scene painted in 1612 representing Peace by Dutch painter Peter Candid. A handsome gallant and his dame are lounging in an elegant palace garden. She is offering him a bouquet of two entwined roses with her left hand while blindly searching with her right hand for more blooms. I imagine that nothing is left to chance in this picture and the language of flowers speaks an intended message. Perhaps her straying right hand gathering more flowers is a depiction of abundant love that is her reservoir of peace. He gazes at her with rapt attention and smiling eyes and although he is leaning towards her and could easily swoop her up in a passionate embrace, he pauses with courtly restraint. In the background all manner of human activities are sprinkled across an ordered landscape. A field in the middle distance, contained by mountains and woods, is being plowed by two farmers with two horses. On the same plane two hunters accompanied by two hounds are chasing two deer in an open pasture where two cows are placidly grazing. 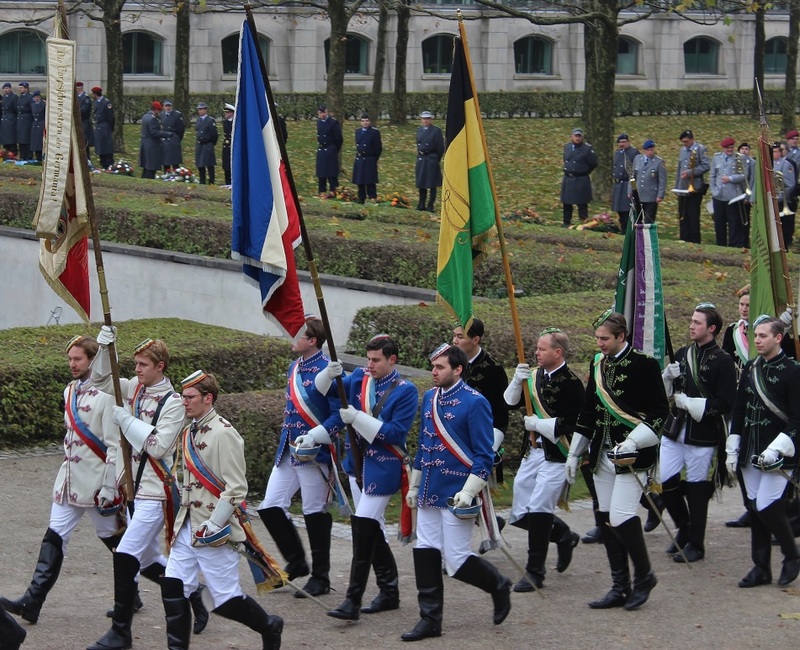 All of this activity is separated by an orchard defining a bucolic parkland where a cluster of courtiers are dancing to the accompaniment of a lively band. Adjoining this park is a formal partèrre garden punctuated by a fountain spouting water from an erect spire that fills a round basin with life giving water. In that rarefied and orderly garden two women stroll with uplifted arms holding sprays of greenery. All of these engaged couples separated by the complexities of the courtly dancers illustrate the different “moods” of peace and allude to the drama of the couple in the foreground, speaking volumes of the progress of love leading to the fulfillment of peace. We arrived in Munich on Election Day when Trump had apparently won the electoral votes required to claim victory. With the discordant, accusatory tone of brutality and bullying that is the hallmark of Trump’s rhetoric ricocheting in my mind, and his ominous threat of prejudicial exclusionary scapegoating, I was chilled to be in the city where similar tactics had been used to grab power with such horrifying results. What is meant by, “making America great again?” How is our system broken when a single businessman can parlay a million dollar inheritance into a multibillion dollar horde? Is democracy really the license to make money without hindrance of protective regulations? Is good business really the ability to avoid participation in our country’s financial running costs by not paying taxes? 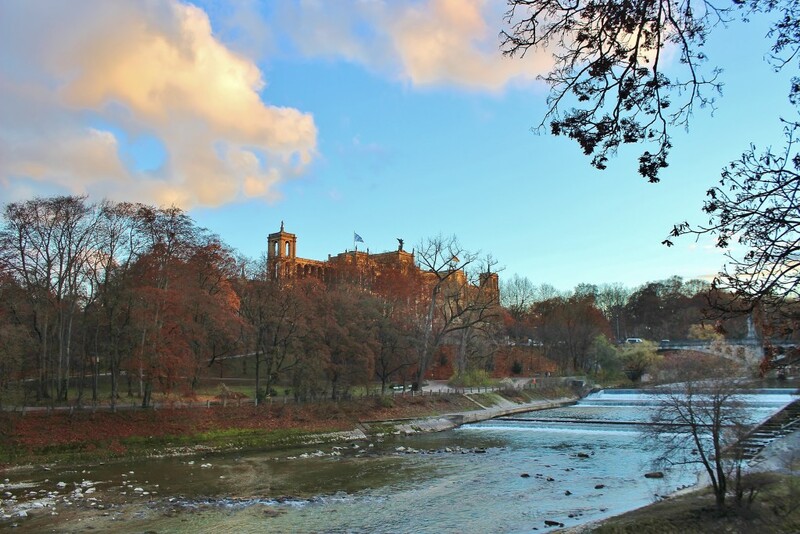 The Isar River runs through Munich passing through the famous Englisher Garten where tall trees form dense woods. Here the broad river’s speed is controlled by a series of “steps” that slow the flow as it passes the picturesque Maximilianeum, seat of the Bavarian Parliament. 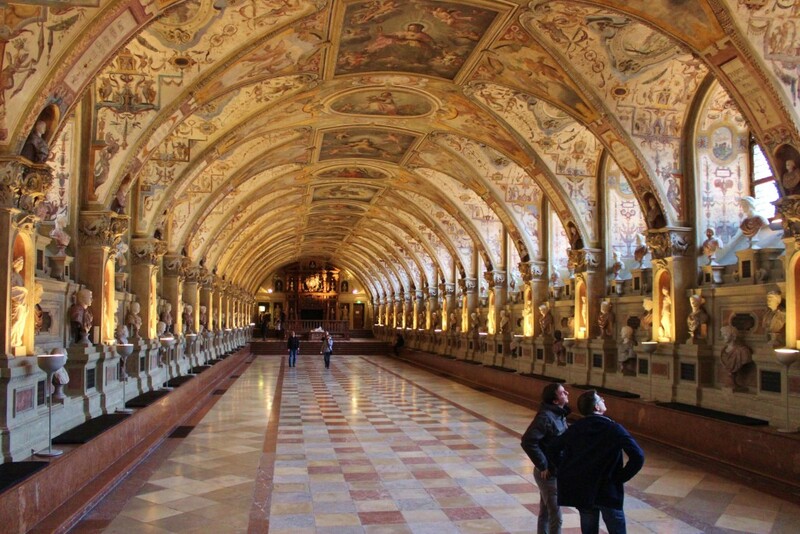 Here is a view of the Antiquarium Hall in the Residence Palace in Munich. It is 230 feet long and supported by 17 broad arches that are entirely covered by an elaborate program of grotesque mural decoration patterned after architectural painting of Rome and the ancient world. 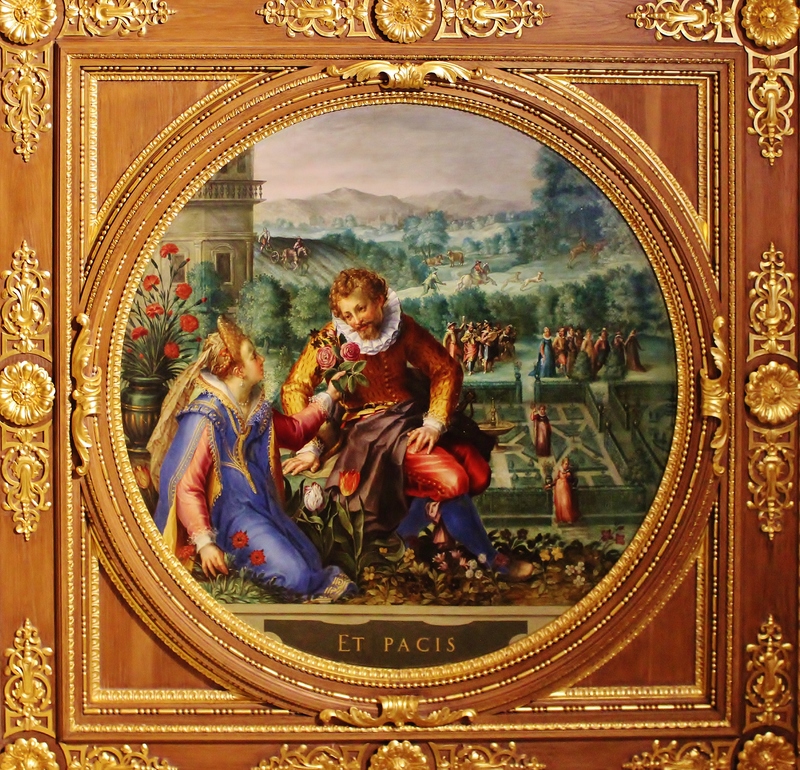 Progressing along the apex of the arches is a series of paintings illustrating the virtues of the Wittelsbach family, hereditary rulers as; Dukes, Electors and Kings of Bavaria from 1180 – 1918. The Sculpture is composed of a collection of 270 Classic portrait busts and full figures. About two thirds of the collections have some original components from antiquity often with extensive restoration. The rest of the sculptures are reproductions dating from the Renaissance, 18th and 19th century. The overall effect, especially with the heavy imperial arches, evokes an ancient atmosphere that is completely unique in my experience. There is an air of mystery as the wealth of sculpture and painting is revealed emerging from the dark shadows or contrasted with the stark chiaroscuro lighting effects on the full figures. 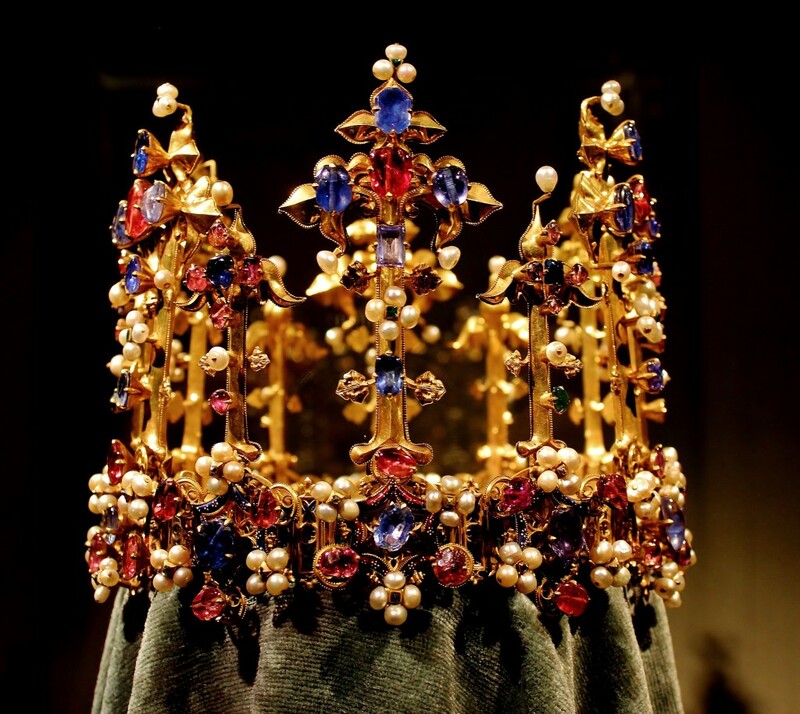 And talking of crowns here is a humdinger! 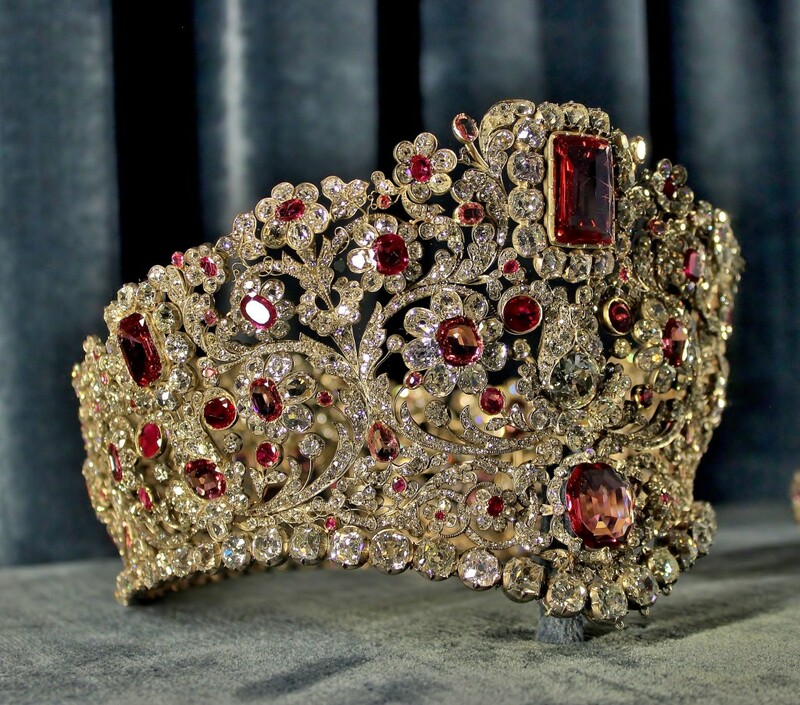 Ruby, spinel and diamond diadem of Queen Therese of Bavaria given to her as a birthday gift from her husband Ludwig I of Bavaria. It was made by Caspar Rieläner 1830, now in the Wittelsbach Royal Treasure at the Residence Palace, Munich. I have to confess that when I first saw this astounding bit of bling I squealed with delight and glee! I am enormously fond of “Objet de Vertu” a term that describes a group of exquisite works of art wrought from precious and semiprecious hard stones often with gold and silver mounts that can be further embellished with multicolored enameling and other gems. 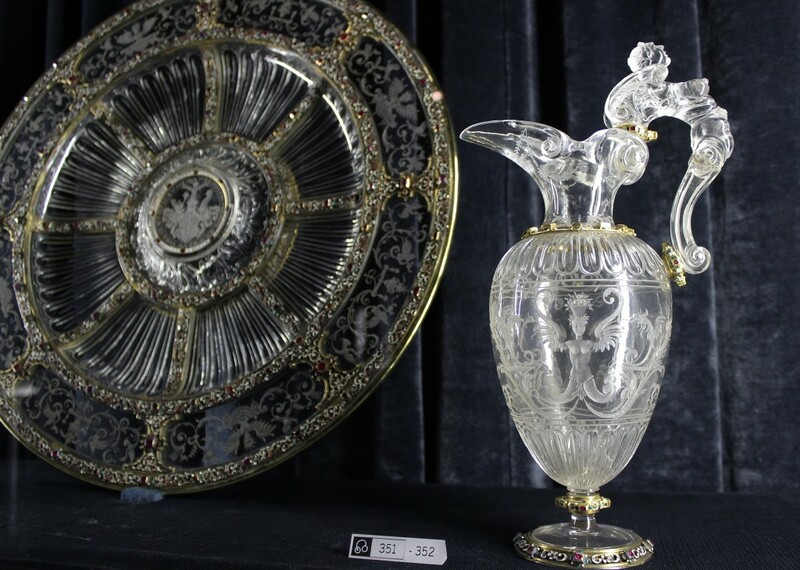 This pitcher and bowl are carved from rock crystal with etched designs referencing ancient Roman sources. A corner of the “Rich Rooms” at the Residence palace, Munich, this seemingly endless palace has many delights and superb furnishings throughout. 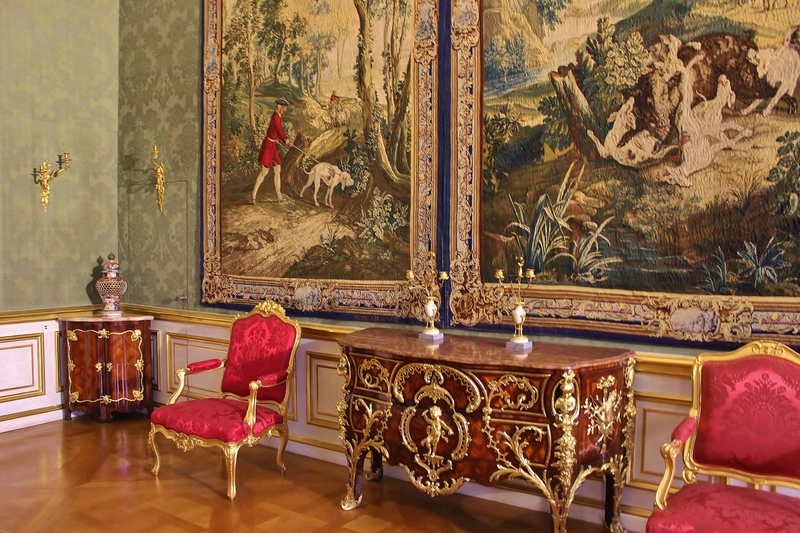 The rich variety of deep green and scarlet silk damask upholstering the walls and chairs is contrasted by the bright gold ormolu decoration of the cabinetry. The soft textures of antique tapestries add a further layer of luxury. The Neues Rathaus or town hall in Munich is located in the heart of the city at Marienplatz. The elaborate historical style is a wonder of Gothic revival architecture and was built between 1867 and 1908 by Georg von Hauberrisser. The Christmas tree was an invention of 16century Germans and greatly popularized by Prince Albert who brought the tradition from his native Germany to England. 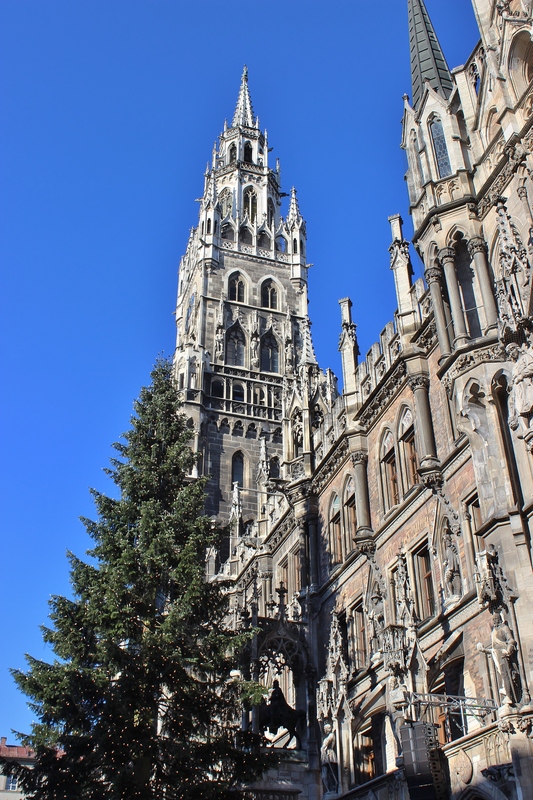 This year’s Tree stands in front of the Rathaus a good five stories tall and is a really beautiful specimen. Decorated with lights, it crowns the Christmas Fair in Marienplatz where ornaments, hot mulled wine and traditional sausages are served from log cabin holiday booths surrounding the square. 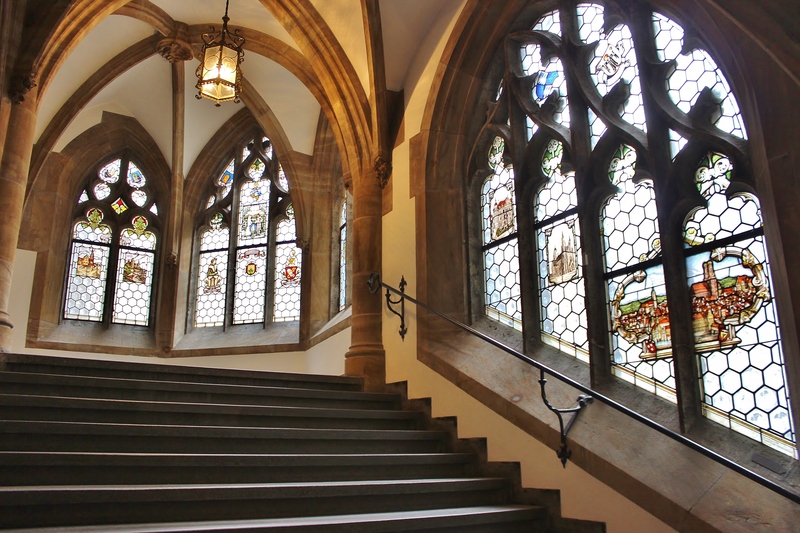 Inside the Rathaus a grand series of stairs and halls are lit by leaded glass windows with hand blown glass rondels holding a collection of enameled glass decorations that include pictures of the major cities, towns and architectural monuments of Munich and Bavaria. 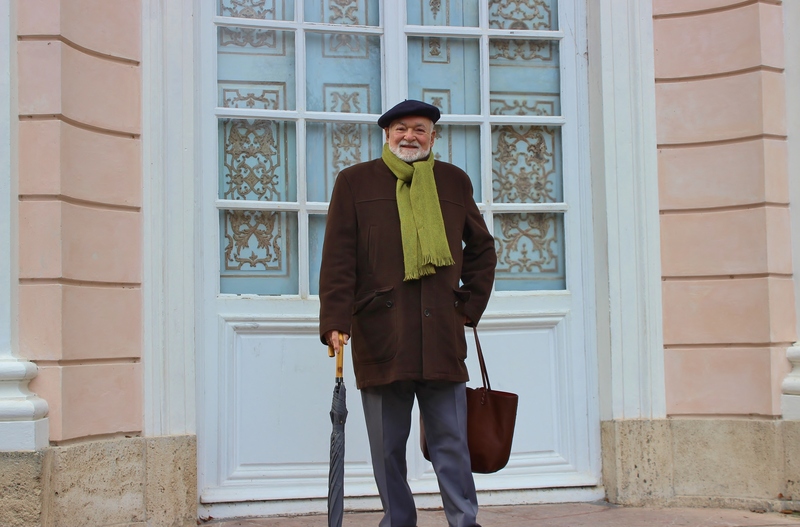 How can I resist including this charming portrait of Leopoldo, the birthday boy, posing in front of an elegant garden pavilion in the extensive grounds of Nymphenburg Palace on the outskirts of Munich, isn’t he adorable? 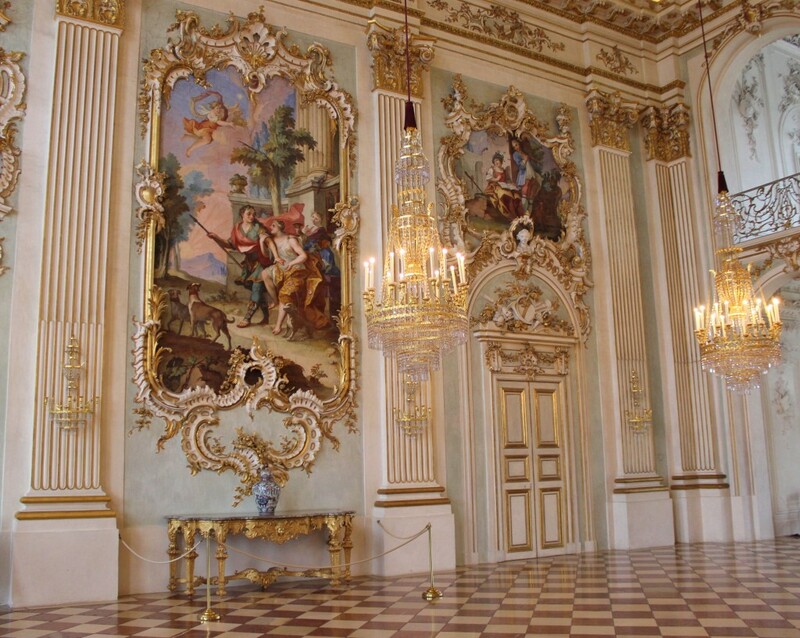 Steinerner Sall is the central entry hall in the Nymphenburg Palace. I am particularly interested in Rococo architecture of both the churches and palaces in Germany. As one of the European countries vying with each other to outrank the other as the most Catholic country, Germany embraced the Baroque style whole-heartedly with its intended mission of enthralling the populace and reestablishing the supremacy of Roman Catholic orthodoxy throughout the world. As a refinement and elaboration of Baroque designs, Rococo styling is quite literally the icing on the cake and I love all the inventive and sensual complexity of the style. This entry was posted in Munich 2016, World Travel on January 5, 2017 by ioryallison3.